Yet again I love to keep up to date with all the latest techniques and trends in the beauty industry. 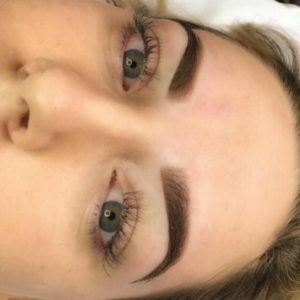 Eyebrows are huge right now and there are quite a few different looks that you can achieve now with normal makeup and semi permanent tattooing. We offer both natural looking brows and power brows for those who like a more glam look. 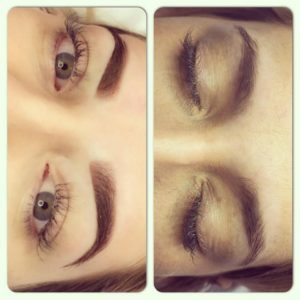 With semi permanent makeup we do always advise that it is best to go for a natural look to start with as you cant wash it off, it is implanted into the skin. The newest technique that I’ve bought back to the salon is the beautiful Ombre style eyebrows. This is done using machine shading method giving a soft and natural graduated shaded brows which are lighter at the fronts. They heal softer than the picture shown and are great for those of you with patchy or thin brows that like the powdered or high definition look. We are totally in love with these brows.